In general, the agreement between summated Hevylite (e.g. IgGκ + IgGλ) and total immunoglobulin assays (e.g. IgG) is good; indeed, comparison of summation data for blood donor sera was used to validate the assays during development  and summation checks are routinely used as part of the manufacturing quality control (Sections 9.4.4 and 9.7). Other studies have also reported a good agreement between summated Hevylite and total immunoglobulin results for normal sera . Eckold et al. compared summated IgG, IgA and IgM HLC concentrations with total immunoglobulins for patients with monoclonal gammopathy, and reported an excellent linear correlation (Figure 11.3). Similar findings were reported by Jacobs et al. when 27 samples from the Dutch External Quality Assessment M-protein scheme and the international standard ERM-DA470k were analysed. Kenyon et al. compared summated Hevylite with total immunoglobulins for 518 IgG and IgA MM patients at diagnosis. A total of 254/518 (49%) of summated Hevylite values fell outside the recovery range (defined as 80 – 120% total immunoglobulin values). Despite repeating 254 measurements, only one sample (an IgAκ) demonstrated Hevylite antigen excess (Section 11.4). Boyle et al. compared total IgM and summated IgM HLC values (IgMκ + IgMλ) for sera from 110 normal donors and 78 Waldenström’s macroglobulinaemia (WM) patients. 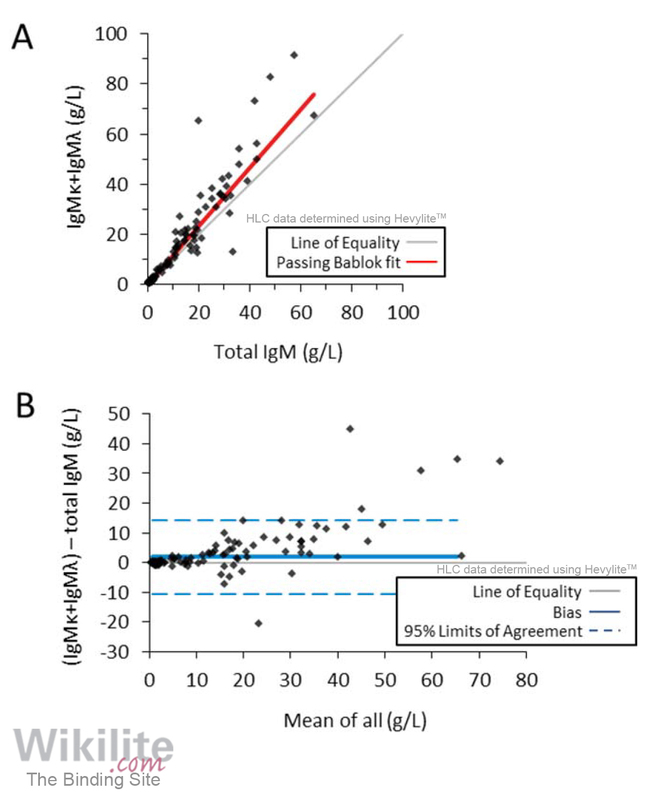 There was a good correlation between the results (Linear regression R2 = 0.90, Passing-Bablok regression y=-0.32 + 1.17x, Figure 11.5A), although Bland-Altman analysis demonstrated that IgM values measured using IgM Hevylite assays were slightly higher than those measured using total IgM assays (bias = 1.8 g/L, Figure 11.5B). Similar findings were reported by Manier et al. and Sarto et al. .
As part of an evaluation of HLC assays for monitoring multiple myeloma (MM) patients, Katzmann et al. compared total IgA quantification and the IgA iHLC for 149 IgA MM samples. Passing–Bablok linear regression gave a slope of 1.124 (95% CI 1.015–1.194), r = 0.97 (Figure 11.4A), indicating a good agreement. Jacobs et al. also compared iHLC and total immunoglobulins for monitoring 4 patients with MM, and concluded that both assays showed a parallel response. 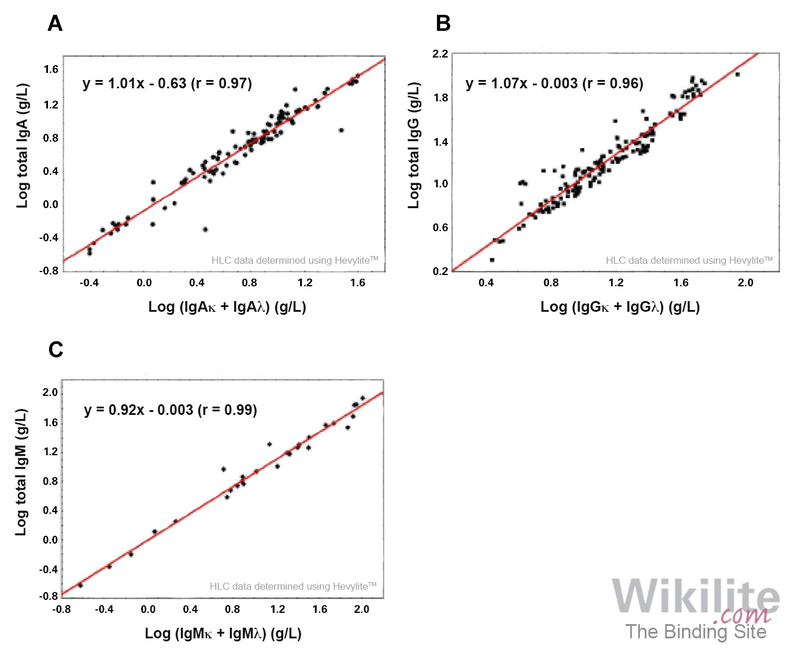 The iHLC concentration was lower than the total immunoglobulin value, but the authors comment that iHLC may be a more accurate representation of M-protein concentration because it measures less polyclonal background than total immunoglobulin assays. Theoretically, the more a tumour suppresses the production of polyclonal immunoglobulin (of the same immunoglobulin class), the closer will be the correspondence between iHLC concentrations with both the total immunoglobulin concentrations and the monoclonal immunoglobulin concentrations, as measured by densitometry of SPE gels.